Sarjeant Gallery Whanganui | Who Am I? The portrait of a mysterious, lightly bearded and be-ruffled gentleman is a star attraction in the Sarjeant Gallery Te Whare o Rehua Whanganui’s upcoming exhibition entitled Revealed – Collection discoveries from our recent move, opening 11 June at the Gallery on Taupo Quay. The right half of the man’s face is darker than the left, which suggests a partial attempt to remove the darkened varnish says Curator of Collections, Jennifer Taylor Moore. The lacy ruff around his neck and cuff, lashless eyes and high forehead give him the air of an Elizabethan gentleman. 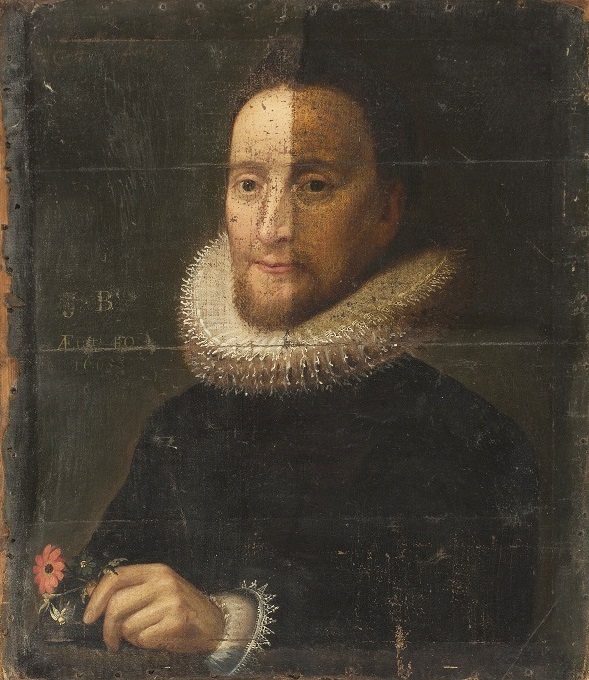 The ruff in particular gives a clue as to the age of the painting. Ruffs were fashionable in Europe between the mid-sixteenth and mid-seventeenth centuries. They were luxury garments, symbols of status and wealth, and the starched lace made wearers hold their chin up in a proud and haughty pose. A loose lace collar had replaced the ruff by the time King Charles I came to the English throne in 1625 but the popularity of the ruff lingered longer in the countries of Northern Europe. Gallery staff found the anonymous portrait hidden among framed paintings when the Gallery moved the collection to its temporary premises. The painting had not previously been documented so its discovery came as a surprise and very little is known about the work. She says they asked the opinion of Nick Lambourne of Christie’s, London, when he was updating the value of the collection earlier this year. “He suggested that because the hands are not finely painted and the work is in poor condition it is unlikely to have a high insurance value. However as it is unlike anything else we have in the collection and has an intriguing story it is of intrinsic value to us,” Ms Taylor Moore says. Other notably perplexing features in the work include writing in the background of the painting. The initials J B, probably referring to the man’s name, followed by ÆTAT 40 meaning at the age of 40, and the date 1665 (which happens to be the time of the Great Plague in London). So the man was possibly 40 at the time of painting. He is also holding a small bunch of unidentified flowers. In the 15th and 16th centuries botanical imagery was used to convey information about the subjects in portraits. Daisies could mean innocence while anemones were used to indicate forsaken love. Because of its fragile condition the painting will be displayed flat in a glass case. If the work was painted in 1665 then it is amongst the 10 oldest paintings in the Gallery collection.